← Oh quai. Books it is. The massive erection that dominates Paris (the Eiffel Tower… what were you thinking? ), the uncomprehensibly large sprawl of the Louvre, the glittering mass of the Grand Palais… Paris may not be famed for its skyline, but there’s plenty of architectural heavyweights jostling for space nevertheless. But as impressive as the big daddies of the cityscape are, I prefer furrowing around the city looking at all the small stuff that everyone else misses. The real nuts and bolts of a city, those tiny details that aren’t deemed attractive or exciting enough to celebrate. You can take your sparkling Eiffel Tower rudely cutting into the night sky; if we’re talking about a real light show you need to look no further than the guy that illuminates the city via a sophisticated network of blinking green lights dotted around every corner. The pharmacy sign guy. That awesome guy. Forget Gustave Eiffel. Let me tell you his story. One hazy day 50 years ago, the pharmacists of Paris were lounging round in their tablet shaped house (let’s say they were in the red end, the white end is of course the sleeping quarters), sipping cups of coffee, and moaning collectively about how trade was flagging. One bright spark piped up and pointed the finger at the choice of signage; the old crayon-drawn ‘farmacee’ sign was starting to look a bit tatty. They scribbled down a few ideas for a new sign but to no avail, being pseudo-scientists of course, and therefore incapable of anything remotely artistic. “We are useless (excluding our talents for making love, cooking and counting tablets and putting them into boxes, and pretty much everything else except sign making)” said one to the rest. “Oui,” said another, followed by a further handful of ‘oui’s’ from the others that put the little pig and his journey home quite to shame. So they all went off secretly to have clandestine affairs and reconvened a couple of hours later and decided that they’d employ a person to do it for them and would pay him a handsome wage. In asprin. They went on to http://www.pharmacysignwriters.net and found Pierre, a failed artist who needed a challenge, and lots of asprin. “We plan to take over the country one pharmacy at a time so help us God so we need you to come up with a sign that not only says ‘Pharmacy’ but also hypnotises potential customers into entering our doors and buying lots of medication that they don’t need,” the pharmacists said. “D’accord” Pierre said, between cigarettes. “I will make you a sign that is the most beautiful sign you have ever seen, vive la France.” So they built him a little workshop in the syringe shaped garden, and he set to work. Being a typical artist, Pierre decided to ignore the first objective of the brief, but by God, went crazy with the second. After a couple of days, the pharmacists put down their boxes of Teenage Mutant Ninja Turtle band-aids that they’d been throwing at each other and went to the garden to visit Pierre in his shed to check on progress. Just beyond the prescription pad-embossed patio doors, Pierre had installed his young apprentice cousin, Yves, to distribute darkened goggles to the passing pharmacists. As they neared the shed, nestled deep down in the needle part of the lawn, a strange green light licked their white lab coats from bottom to top, as Pierre threw open the doors. An earnestly flashing, giant green cross greeted their eyes, and provoked such excitement among the crowd that Yves had to be dispatched back to the tablet house to fetch a few rounds of ibuprofen. 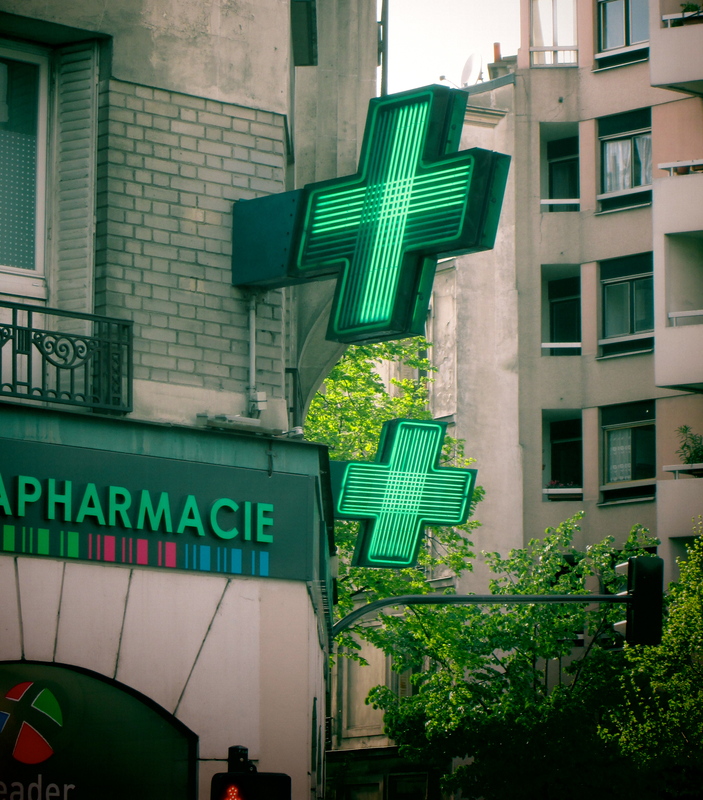 Hypnotised by the sheer power of his creation, within a week every pharmacy in France was adorned with a blinking green appendage, attracting saucer-eyed customers to each premises like rust to a dirty, old bicycle. I want what you’re smoking……..